Cut the baguette into 3 equal pieces. Slice each piece lengthwise, stopping just short of cutting all the way through. Divide the Wee Brie among the baguette pieces and spread brie on each portion. 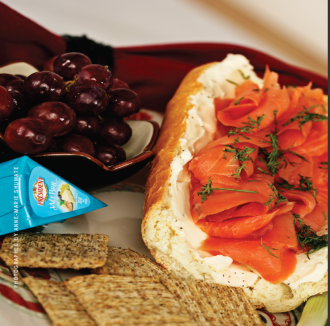 Separate the smoked salmon into 3 equal portions and place on top of the brie. Sprinkle fresh dill over each portion. Remember, a little dill goes a long way. Serve with fresh seedless red grapes.